Happy Friday! 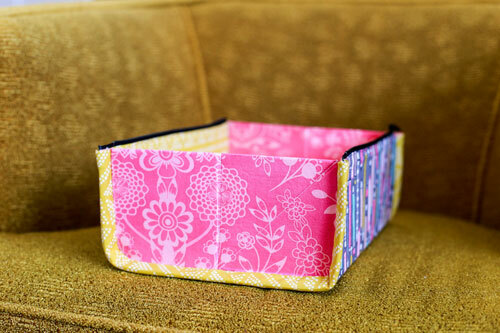 Earlier this month I had the opportunity to do some testing for Aneela Hoey's new pattern, the Zip-Up Tray Pouch. I wanted to share my pouch here and talk a bit about it today! 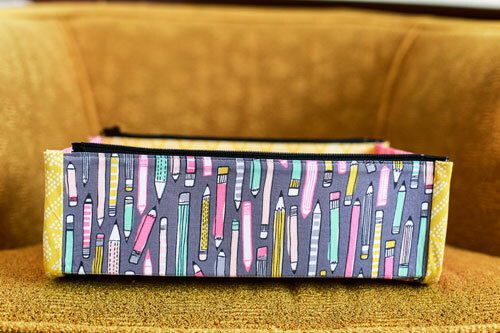 I recently picked up this really cute pencil fabric from Noteworthy by Erin McMorris, which I used as the starting point for my pouch. I pulled blenders from my stash to match for the interior, sides, and binding. Interior + binding fabric is from Cultivate by Bonnie Christine. Side panel fabric is from Essentials II by Pat Bravo. This was my first time using a separating zipper, which is a must for this project. This allows the pouch to easily convert into a tray. I bought my 10" separating zippers from Zipit. 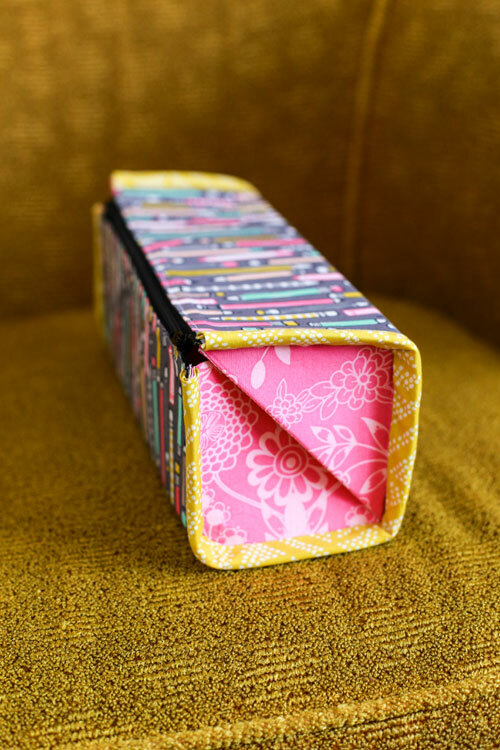 The construction of this pouch is fun and interesting, and isn't too complicated. I love how it snaps back and forth between pouch and tray. I took a quick video to show how it opens and closes. I've already used this pouch to corral hand stitching tools on the couch. This project does require some hand sewing to finish, but the whole thing came together easily in an afternoon! 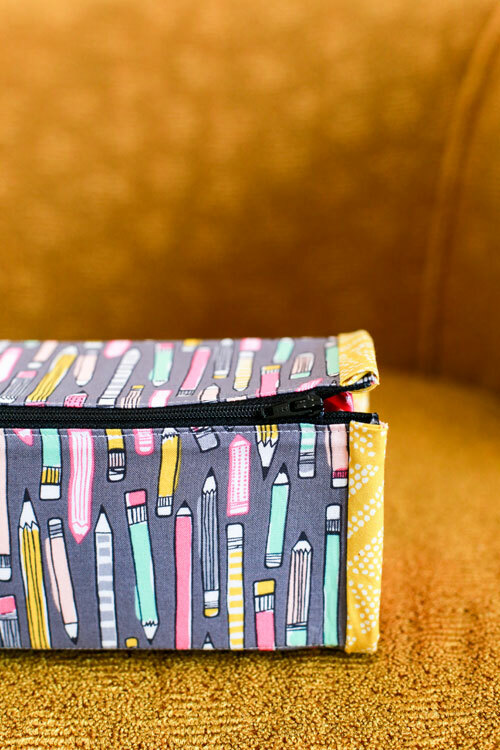 Find the Zip-Up Tray Pouch Pattern, in Aneela Hoey's shop, here. Very clever. I will need to try this. Would also make good gifts. Thanks so much for reviewing this new pattern! I bought the pattern the other day and can't wait to make mine! 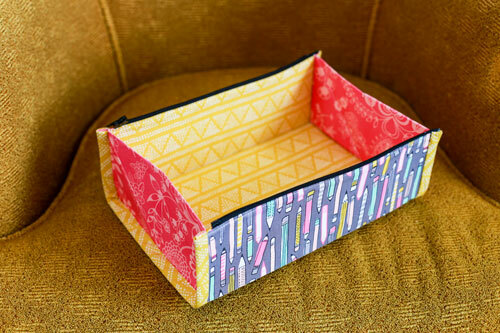 Yay Aneela for coming up with this great pouch/tray! Such a great design! Love your fabric choices. Genius! Thanks for showing your version. I bought this pattern a few days ago, I just need to get the proper zipper so that I can make it. Thanks for the video, it makes me even more excited to whip up a few of these. That would be the greatest travel pouch. When you arrived at your hotel/rental apartment, you'd have the tray to corral all your stuff so you wouldn't leave it behind! Genius! Is the small bit of hand sewing visible? Other than sewing on a lost button, my hand sewing skills bring the Frankenstein monster to mind. Yes, the binding is hand sewn! What kind of stitch does the pattern call for and how much? I'm terrible at hand sewing and was trying to figure out if I could do it by machine by just looking at the picture. The only part that is handstitched is the binding, and it simple says to hand sew the binding in place. It doesn't call for a specific stitch. Hi, I am loving this pattern. I need to know if am allowed to teach it to my sewing group ladies,when I have bought it? I'm trying to figure out why you would stitch the binding by hand. It looks like any other binding that I've done on the machine. Is is just to keep the top stitching from showing? I don't have issues with good neat top stitching showing. With the stiff interfacing, I think it would be pretty difficult to do it on the machine! The pattern recommended hand-stitching it, so that's what I did, but to each their own!